Hint: Some versions of Windows may require you to run FileBoss in administrator mode to enter the registration key and have it remembered. If FileBoss is having trouble remembering the registration information, exit FileBoss, right-click over FileBoss's icon and select Run as Administrator, enter the key and then exit and restart FileBoss. You can bring up this dialog from the Trial Reminder screen, the Expiration Notification (displayed when the trial period has expired) or by using the Help > Enter Registration Key... command from the main menu. If you copy the email to the clipboard before calling this dialog FileBoss will attempt to register itself immediately. If successful FileBoss will tell you and let you get back to work immediately. If you have an email with the registration name and key, simply copy the whole email to the clipboard and then press the Paste from Clipboard button. Alternately you can type in or paste the name and key code into their respective fields individually. Typically you will receive an email with the name and key code that must be entered to activate you license for FileBoss. Once it has been selected press Ctrl-C to copy it to the clipboard. After the information has been copied to the clipboard return to this dialog and press the Paste from Clipboard button. FileBoss will examine the clipboard and paste the name and key code into the appropriate fields. 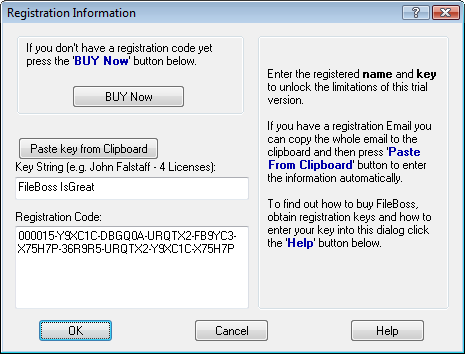 Enter the registration key that was sent to you when you purchased FileBoss. Usually the key code is 60 characters long separated into ten groups of six. Enter the name under which this copy of FileBoss has been registered. Clicking the BUY Now button will open your browser and connect you to the The Utility Factory's store on the Internet where you can purchase a license for FileBoss and receive your key by email, usually within minutes. FileBoss has a non-intrusive installation and a standard, easy uninstallation procedure. Full details are here.